Title Tag and Meta Description are one of the most important parts of a web page. When you type something into the search engine’s text box and hit the enter button, the result always fills with these two HTML elements. The fact is that they have to be powerful enough to click your mouse through those search results. Learning to master them will definitely worth invest your time to give yourself some SEO success. So without adding any further blah; let’s move to the core talk. A title tag is an HTML element resides between the head tag of a web page. Its purpose is to define a page’s content in a few words, typically within 50-60 characters including spaces. Take a look at the following title tag example. Since the title tag is a part of metadata or meta element, it can’t be found anywhere on a body of a web page. Note: If you don’t know what Metadata is, I’ll recommend you to check out this video by Eric Enge before proceeding. 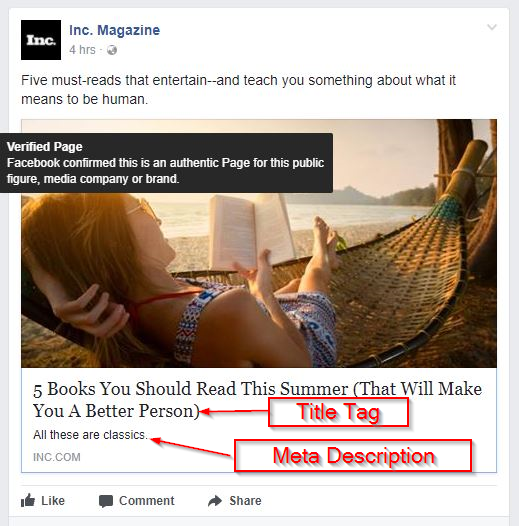 In the below screenshot the post title tag and a meta description are appearing on Facebook feed, published by Inc. Magazine. One more thing is that if you bookmark a web page in your browser the title element will be used as a bookmark name. Although you are free to change that default title. 1. Targeted Keywords at First: Use your targeted keywords as before as possible. It’ll help search engines to better understand your page’s relevancy. And the searchers also prone to click the title if they find their keyword at the first place or sooner. 2. Avoid Same Keyword Repetition: Do not repeat the same keyword more than once. Instead, use alternative words tactically if needed. Repeating the same keywords will make your title look suspicious and you won’t get high rankings in the SERP. This activity is a part of keyword stuffing and only used by the spammers. 3. Character Limit: There’s no any definite rule for a title tag’s character limit. But it’s recommended to write it within 50-60 characters to avoid truncating your post title. The search giant Google has a snippet length of 600px. Meaning they don’t calculate title tag width in characters instead do calculate in pixels. 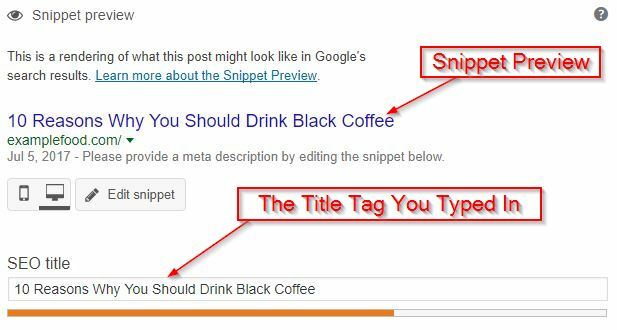 If you are using WordPress along with the Yoast SEO plugin, you can view how your title tag will look like on Google using their snippet preview tool. Bing currently has a snippet pixel width of 520px, so you might lose a few words on Bing whereas on Google don’t. But these measurements might be changed by them at any time. Keeping your characters within 50-60 is an optimal length to avoid truncating in almost every major search engine. According to Moz, the post title can also be shrunk if you use more uppercase letters rather than lowercase letters. Such as capital letters of W and X. They are comparatively broader than other uppercases, so eventually eat up more room and search engines leave them with three dots or ellipsis. 4. Placing Your Brand Name: Is your website is a big brand? Then consider adding your brand or website name either at the first or last place in your title tag (personally, I’d recommend putting it at the last). But don’t forget to add a separator or delimiter to split brand name from the post title. Pros: Writing your brand or website name in the post title helps driving search traffic, who make their query string using your website name along with the seed keyword. Cons: Each and every piece of article or blog post can’t be expressed in very fewer words. Especially the problem arises if your brand name a little bit longer and eventually it’ll cut off your title before it ends to make your website name visible. 5. Letter Capitalism Inconsistency: Some webmasters do one mistake is that they don’t consistent while using capital letters in post title tags. 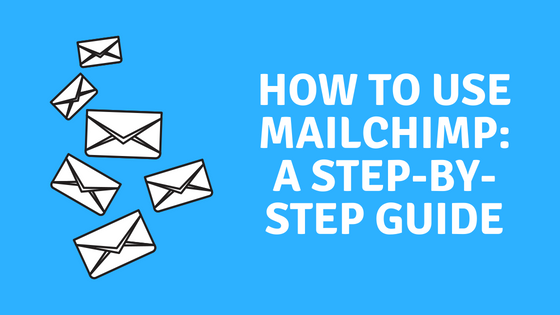 This kind of practice will demote your search rankings. It’s neither liked by search engines nor by the searchers. I’d recommend you to use capital letters in every first letter of the words except stop words. It increases readability and will also help you to keep up the capitalism consistency. I found this page link on the 23rd page of Google. And this is one of the factors they ranked low. So if you are writing post titles in this way, go ahead and make it consistent in terms of letter capitalism. 6. The Same title on Multiple Pages: Having the same post title in multiple pages will cause damage to your site reputation and the website ranking will be demoted drastically. 7. 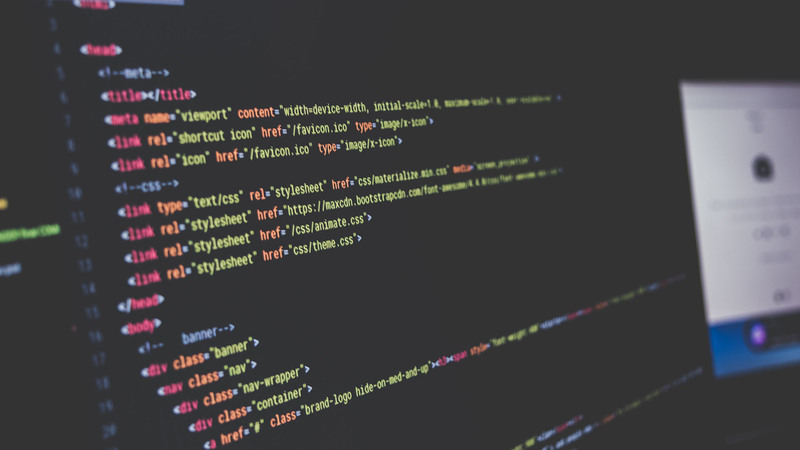 Parse titles to Match Query String: While parsing a phrase in your title tag, keep in mind that it’ll meet the users’ query strings. You should not make a post or page title recklessly without thinking about how users will type their query in the search box. You’ll be aware soon what I’m talking about. Then the search engine most likely to return the title tags, which are holding the exact same phrase (might not be ditto in every time, but it’ll very similar), you’ve just typed into the search box. And it’s not always mean that you have to parse that exact phrase while making a post on this topic. Making copycat title tags (stealing others post titles) is also not a good practice, and searchers probably won’t click on that page title. 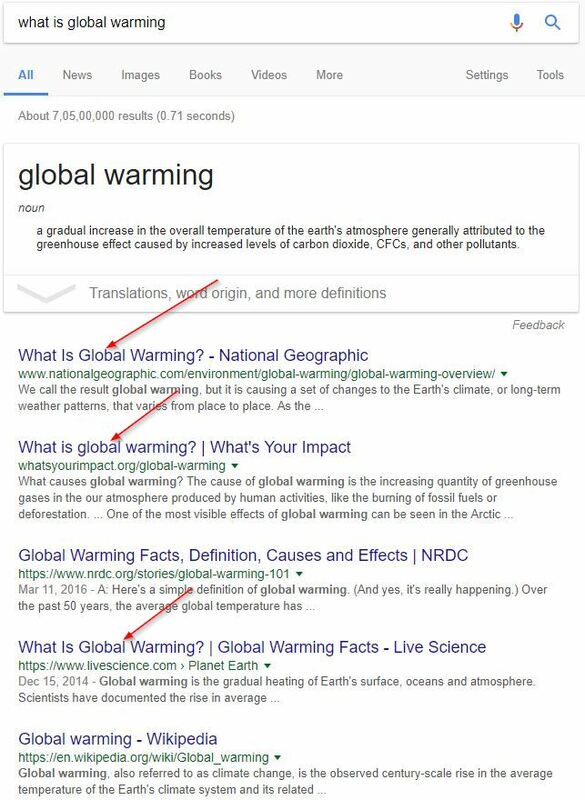 Because Google (and other search engines) knows that both queries are signifying the same topic, just words are different that is being used. So if you type, define (topic name), what is (topic name), (topic name) definition etc. into the search bar, the search engine will return almost the same results for these query strings. Unlike traditional search engines, today’s search engines are now smart, so you are free to use keyword substitutes to make your own unique title. Attention: While writing title tags, please do keep in mind that it is ideal to write them always within 50-60 characters (though you can write up to 70+ characters) to avoid truncating in the search results. Google keep changing this character limit time-to-time, so it is highly advisable to follow the 50-60 character limit to avoid rewriting them in the future. Well, a Meta Description is an HTML attribute value (is also called an HTML tag interchangeably) sits inside the meta tag typically within 150-160 characters long including spaces. A description meta tag is declared by the name attribute with the value description and the actual description or snippet is mentioned as the value of the content attribute. By doing the above practice, the value of the content attribute (that means the meta description) will appear on the search result below the blue colored links. But apart from the technical aspects of the meta description, there are some non-technical success protocols you should follow while writing them to grab the searcher’s attention. To create a great and splendorous website meta description you need to incorporate some psychological aspects so that the searchers’ desired information can be pinpoint immediately to make them click through to your site. 1. Put Your Targeted Keywords Tactically: The most important thing comes at first is including the target keyword in your meta description (My recommendation is to put it as soon as possible). Search engines will use your meta description as a relevancy factor to show them up on SERP. As Google and other search engines reinforce the pages which are written with target keywords both in the title and meta description. Suppose you are writing an article about ‘Yoga Benefits’. 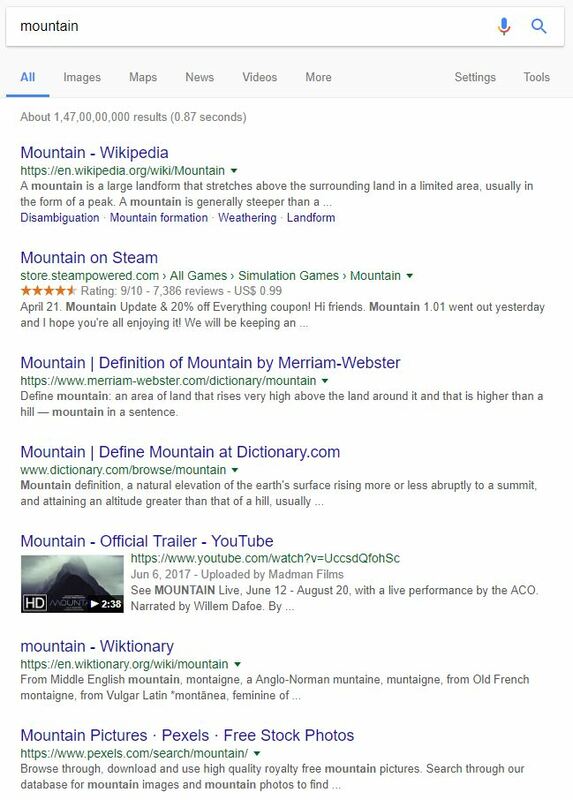 The target keyword is putting tactically in the above meta description example, both at the beginning and end of the content description. Search engines also highlight or bold the searched keyword in their snippets to catch the users eyes. 2. Incorporate Call-to-Action Words: Call-to-Action or CTA has the power to compel users. It is mostly written in the sales pitch to persuade the users to convert them into buyers. These are the words like Learn, Grab, Discover, Find and any other kind of words that imply to take such action. But these CTAs are content specific. You can use them if your page is about selling products, containing information etc. They are incorporating call-to-action to the web page’s description. The first one is the word ‘Find’ at the very beginning and an another CTA word ‘Read’ in their next sentence (the two underlined words). They beautifully manipulated the CTAs two times to make it really a compelling one. 3. Make Shorter to Avoid Shrinkage: According to Google Webmasters Central Blog, there’s not any ideal length set by them for meta description. But you should still follow the optimal length between 150-160 characters counting spaces. It’ll help you to avoid shrinkage of your description on the SERP and will also help to reach its fullest potential. 4. Be Holistic: Meta descriptions are like an extended version of the title tags. The description meta tag gives you the second opportunity to articulate your title tag more explicitly (since it has more room than the title element). Shure also stating that by incorporating the outcome makes a meta description stand out from others. And he is also saying that the most web page description comes only with the solution to the users, which looks quite common and ordinary. 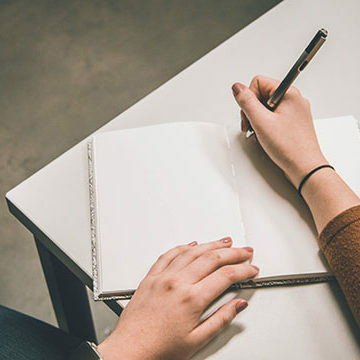 It might not be possible to include all of these three ingredients, but if you can add at least two of these (and letting the outcome as a compulsive factor) the page description will definitely be eye-catching. 5. Invoke Curiosity: Invoking curiosity in meta descriptions signifies what you shouldn’t mention while building up this tiny snippet. Though being holistic is an ideal nature of a perfect web page description, do not give the whole idea that the searcher is going to read about. 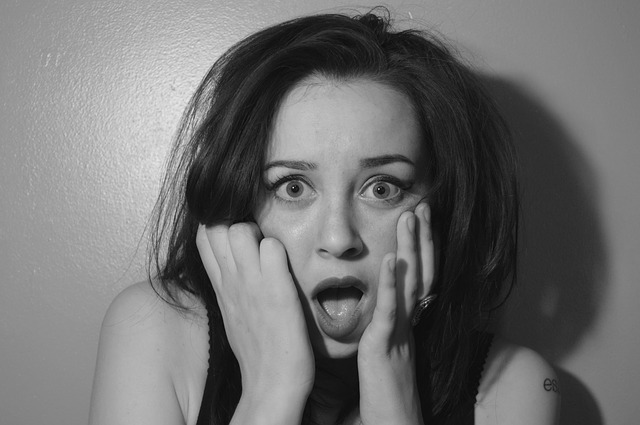 Create a sense of curiosity so that the user will compel to click through to your website. 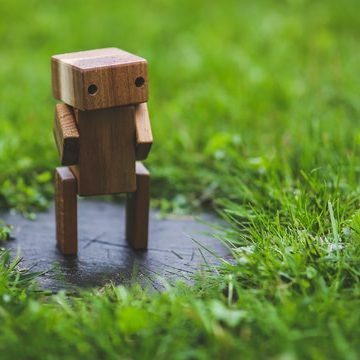 One point should you keep in mind that the curiosity is generally applicable in informational queries, in which a searcher typically behaves like an information hunger. Look at the following description tag example returned by Google for the query “green tea benefits”. This meta description from the Lipton green tea website invoking the sense of curiosity by using the phrase ‘it’s also a very healthy drink!”. They are not stating any kind of real benefits in the page description. Eventually compelling the searchers to click through to their website followed by the CTA word ‘Learn’ in the next sentence. 6. Avoid Duplicacy: Iterating the same meta description on multiple pages can cause harm to your site. This is a super cheap practice. Make them quirky and meaningful. You need to write your page description according to the content of the page. 7. Don’t Do Keyword Stuffing: I think most of you are already know or heard about keyword stuffing. But if you still don’t know what keyword stuffing is, it’s a practice of writing the same targeted keywords and phrases repeatedly to game the search algorithms. This activity is typically performed in order to gain high search engine rankings. This is quite a traditional black hat SEO tactic. 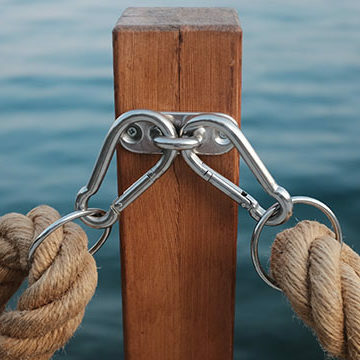 The search engines will catch you and won’t let you rank high in SERPs. Stuffed meta descriptions are neither loved by search engines nor by searchers. Better off staying away from this suspicious activity. Attention: The ideal meta description is to write within 160 characters including spaces to avoid the three dots or ellipsis before the description gets ended by itself in the SERP. As a rule of thumb is to write a fairly short meta description, which can fuel both curiosity and click-throughs. Making super perfect title tags and meta descriptions is not an easy task. It needs time and effort to craft them for getting lots of click-throughs. Like personally, I spend lots of time while crafting meta and title tags. You have to give the same weight to them as you give on your core content (the article or the post). I’d urge you to check others page titles and descriptions in the SERP (at least the top 20 results) before making yours. They’ll help you to be inspired to craft better post titles and descriptions. So you need to consider the steps to follow and to keep your eyes on what others are doing at the same time. 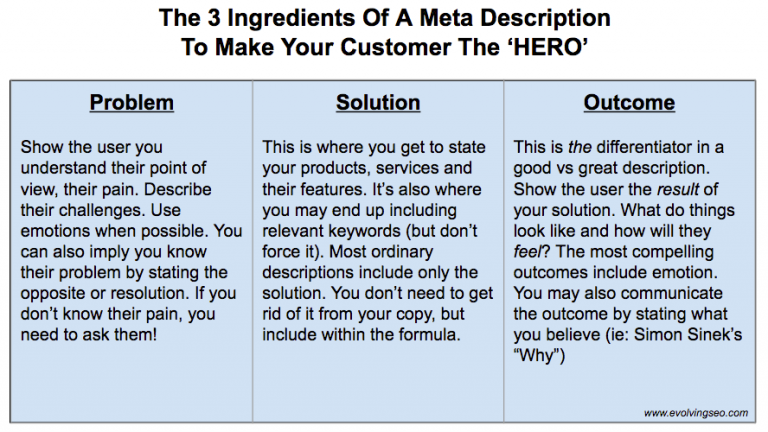 How do you craft your own meta descriptions & title tags?